When: Jan 17, 8:30 pm ET (gmt-5)/ 5:30 pm PT/ Jan 18 9:30 am China (gmt+8). About this Webinar: "Students have ideas that can change the world but do not know how to develop or express their ideas. 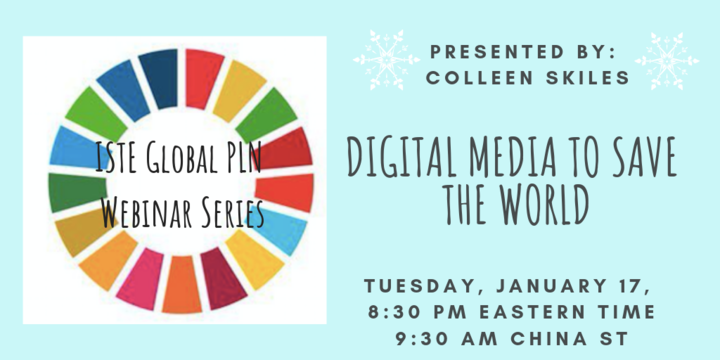 Colleen Skiles will show you how in this ISTE Global Collaboration PLN webinar. With "Actions Impacts", students work in steps to use digital media to bring these ideas to life. Students invent, innovate or campaign for a Sustainable Development Goal, then pitch it to a Shark Tank for funding. Some of the digital media that students use are Canva, Adobe Spark Post, Page and Video, iMovie, Stop Motion, Vlogging, Blogs and more. Learn how digital media can save the world." About Colleen: A Middle Level Modern Language Educator who is a Google Certified Trainer and Apple Teacher. Colleen teaches at Troy Middle School and Troy South Middle School in Lincoln County, Missouri. Her goal is for all my students to understand that they have the power to change the world. Login: Details for logging in, will be sent closer to the date for those people who register.